I use a cleaning schedule. Know why? 'Cause if I don't schedule it, it isn't happening. There are people in this world who are 'cleaners'. You know the type, where they always have a sponge in hand, ready to attack germs at a moments notice, and fending off dust with the greatest of ease. I am not one of those people. Dust bunnies are pets around here. My husband is a cleaner, which should explain why our home is not yet a 'hovel', but I've been told by my mother that I need to 'do my part'. Aren't mothers so bossy? I mean really... but if I want to go to the prom, I'd better listen. Martha Stewart makes a monthly calendar with all her chores on it. So, I'm just like Martha. Without, of course, the money and the criminal record. I love Martha. Do any of you operate better with a schedule? I respond well to structure, I'm like a toddler that way. I also have been known to eat paste, but that's for another post. What a great calendar! Thank you for sharing it! Glad you are back to blogging regularly and feeling better! Maybe I shoud adopt your system as I don't have one and it's hit and miss for when the chores get done. 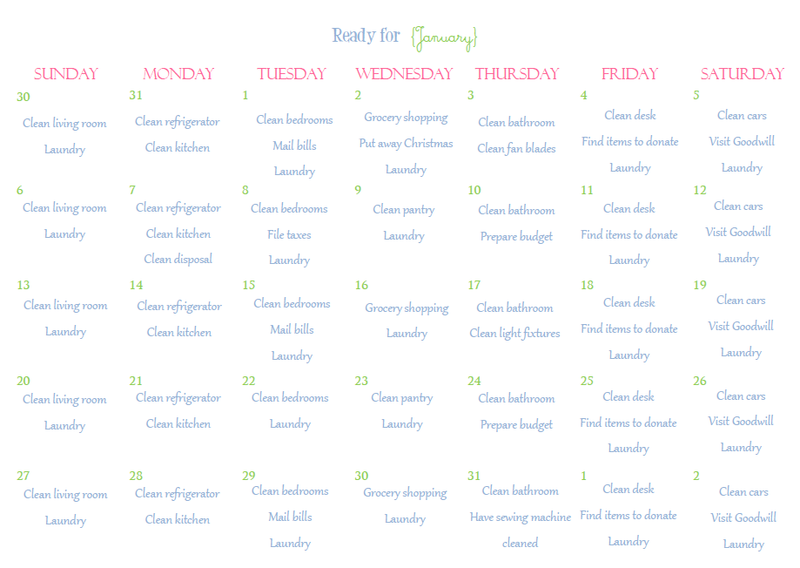 You have 'laundry' listed ONLY 5 days/week?? you're amazing! Go Martha! No I can't operate with a schedule, not at all. I wound't like to see my failures when I could not get something done or didn't feel like it. Sometimes I work better under pressure like if we are expecting company! I do laundry when we need it, I may only do it 4x a month, rarely that much. When I worked at a girl scout camp we had to fill out a "weekly" schedule, accounting - for the most part - every hour of the week and where we would be. When I was in college I continued using a weekly. I would schedule myself a rest hour every day so I wouldn't over-nap and skimp on the studies. Now when I feel really overwhelmed I make myself a weekly so I know when I should be doing things, when I should have my me-time, and when to relax. I also really hate to be bored, so working 3 jobs and doing extra at school helps my schedule stay full and focused. Like mini-wheats. If my life looked like that, I'd just get me a self-applied garrote and be done with it. I choked on my creme soda reading this comment. I'm still laughing. You are terrific. You are the most organized person I know. What do you feed your dust bunnies? I'm organized. As far as cleaning, I'm not as scheduled due to my mother was so scheduled that we couldn't ever go away until that days chores were done. This is a great schedule! You are so organized! I would love to have you share this and any other projects you have at my new Pinterest Power party if you have a chance!! 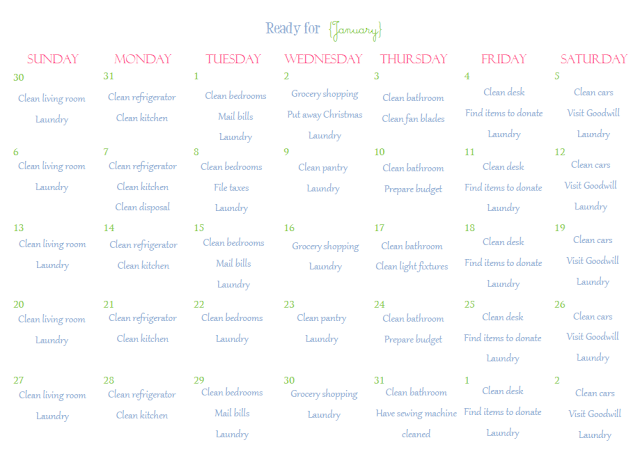 Great cleaning schedule! I'd love to have you link this to Titus 2 Tuesday this week on Cornerstone Confessions.. I hope to see you there. Without a schedule, with who's responsible for what, we don't have dust bunnies, we have dust elephants! Not good for an asthmatic with dust allergies. Guess who gets to do the dusting? Right. Gotta make a chart specifically for the 27 y.o. with autism without a job who wants money. Tried charts but not one like this. Thanks. I'm so glad I'm not the only one that has to have a schedule! For some reason, in my brain, I think there is no cleaning to do unless it's written on a schedule. That part about your mom is too funny! And, does Martha seriously clean her own house?!? I bet even Martha Stewart ate paste at some point ;-) What a great idea. Maybe if I put it down on paper I'll be more inclined to get something clean. Thanks for sharing! This is a great idea! I am the type of person that looks a mess and gets overwhelmed and doesn't know where to start. I think if I broke it down day by day it would be easier. Thank you for the great idea!